The publishers Wordwell have announced on their website the planned publication within the next few weeks of a new book that I have contributed to. 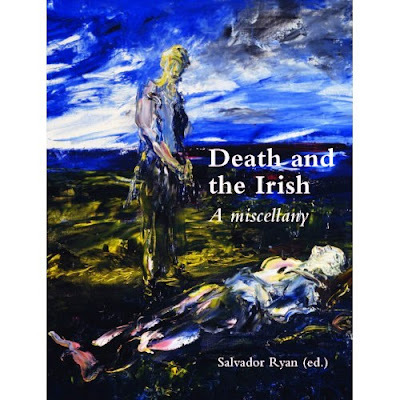 Death and the Irish, A miscellany is a collection edited by my friend and colleague Salvador Ryan, who is Professor of Ecclesiastical History in the Faculty of Theology at the Pontifical University in Saint Patrick's College, Maynooth. In the past I have contributed to two of the three volumes he has edited and co-edited with Bishop Brendan Leahy in the series Treasures of Irish Christianity (Dublin: Veritas, 2012-2015). Wordwell have been publishing for over 30 years, making a contribution to Ireland's culture and heritage with books, magazine and journals. The topics treated in this anthology include: the Galway girl who was buried with her horse in the fifth or sixth century; the account of the curious death of a little-known Irish saint in medieval Norway; the Black Death in Kilkenny; death and sexual transgression in medieval Ireland; grisly deaths from the Irish annals; the funerary monuments of clerical wives in early modern Ireland; the forgotten Connacht massacre of 1647; a 17th-century Belfast ghost story; an Irish story of cannibalism on the high seas; the records of an Offaly coroner during the Great Famine; the Derry ghost who imparted information on the missing Franklin expedition in the Arctic in 1849; Jewish burial customs in 19th-century Ireland; death and Irish Freemasonry; the Irishman whose body was shipped back to Ireland from Italy in an upright piano; death in Irish folklore; the history of children’s burial grounds in Ireland; the ritual of tobacco use at Irish wakes; memorial cards and Irish funerary culture; death in Irish sermons; funeral rites among the Irish Travelling community; death and dying in contemporary Irish pagan belief; the link between commemoration of the dead and humour; deathbed visions; attitudes towards death and dying in modern Ireland, including the impact of social media on the culture of commemorating the dead. And there is more. I shall leave you guessing until publication which contributions are mine. He adds: ‘Needless to say, it belongs on every shelf!’ But then, he would. Pre-publication orders can be made through Wordwell. During the past week, I have been working on possible cover illustrations and photographs for the handbook for the coming academic year at the Church of Ireland Theological Institute. CITI has a small yet interesting collection of art, including a painting, possibly of Montmartre, by Maurice Utrillo (1883-1955), a French artist who specialised in Paris streetscapes, and sketches by the stained-glass artist Evie Hone (1894-1955) that she used for her stained glass window in the parish church in Tara, Co Meath. The collection also includes Athenian Evening by May Guinness (1863-1955), an early Irish modernist and known as ‘the mother of Irish modernist art.’ She was born in 1863 in Tibradden, Rathfarnham, Co Dublin, as Mary Catherine Guinness. She was a direct descendant of Arthur Guinness, through his eldest son, the Revd Hosea Guinness, and lived all her life at Tibradden with her sister Evelyn Guinness (1867-1906), who was also an artist. May Guinness was a friend and teacher to both Evie Hone and Mainie Jellet (1897-1944). She began exhibiting in 1892 with the Water Colour Society of Ireland, and over the next 60 years she exhibited more than 120 paintings with the society. In 1894, she travelled to the art colony at Newlyn in Cornwall, along with her fellow water colourist Mildred Anne Butler (1858-1941). She was an advocate of plein air painting. Back in Dublin she encouraged younger artists to experiment with colour and form, and applied herself to various mediums, including fresco painting and decorative needlework. Her work with colour led her to admire the decorative style and use of colour by Matisse and exponents of the Fauve tradition, and she studied in Paris under Kees van Dongen. During World War I, she was a military nurse in the French armed forces and was awarded the Croix de Guerre and the Medáille de la Reconnaissance Française for her bravery. She had an exhibition of her work at the Saint Stephen's Green Gallery in 1922 and from 1922 to 1925 was a pupil of the Cubist painter André Lhôte (1885-1962), who also worked with Evie Hone. In the 1930s, she exhibited at the Mills’ Hall in Merrion Row, while also exhibiting with the Dublin Painters and the Irish Exhibition of Living Art, as well as at the Victor Waddington Gallery. May Guinness was still painting in her 80s. She died at Tibradden on 19 July 1955 at the age of 92, and was buried in the churchyard in Whitechurch. It was the same year both Evie Hone and Maurice Utrillo died. A retrospective of her work was held a year later her death at the Dawson Gallery, Dublin. Many of her works, including her Mardi Gras, are in the Highlanes Gallery, Drogheda. Her brother, Colonel Charles Davis Guinness (1860-1939), was the ancestor of both the late Charles Guinness (1932-2004) of Tibradden, for many years a churchwarden in Whitechurch, and his niece the writer Selina Guinness.